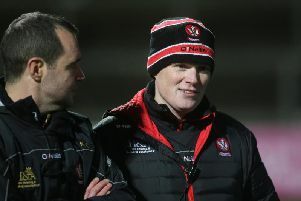 Derry manager Damian McErlain received a timely injury boost this week with Sean Francis Quinn, Ryan Dougan and Conor Mulholland all back in contention for Sunday’s Division Four trip to Fraher field, Waterford. Mulholland has recovered from the ‘flu which kept him out of last week’s comfortable victory over London in Ballinascreen with both Quinn and Dougan fit again following minor injuries. Michael McEvoy and Conor McCluskey should also be available after club commitments seven days ago. There was further good news when the county’s Sigerson Cup contingent came through the midweek quarter-finals largely unscathed as Shane McGuigan starred for St. Mary’s with five points in the victory over Maynooth on Wednesday. Brendan Rogers, who was back among the substitutes against London, could also be in line for a first run out of the new season. Derry will travel down to Waterford on Saturday for Sunday’s 12.30pm throw-in and are one of three teams sitting on maximum points following the opening two rounds of the league. Leitrim currently lead the way from the Oak Leafers with Limerick tucked in third, the three separated only by scoring difference. Despite only minimal time to work with the full squad this week, Derry once again go into Sunday’s game as strong favourites against a team still waiting on their first point after defeats to Limerick and Wicklow. 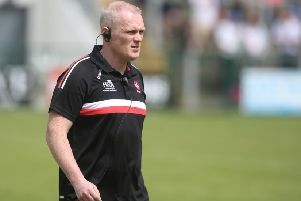 It’s a position McErlain and his players have become used to in the first few weeks of Division Four with the Derry manager insisting their focus has to be on setting and maintaining their own standards in games. “It is massive for ourselves that we do keep our intensity levels high, keep driving on, keep improving and set our own standards,” explained the Derry manager. “That defensive approach is the game nowadays and particularly with ourselves. Other sides are going to look at us as favourites coming into games and are going to try to stifle us. Waterford manager Benji Whelan is in his first year in charge and hasn’t got off to the start he would have hoped for. Tom McGlinchey left the Deise in relatively decent shape with their Championship victory last Wexford a high point of the summer for them. Whelan, however, will have come into the job with his eyes wide open in a county dominated by hurling. The Waterford manager admitted when appointed that the league was his priority and he will likely try to make things as uncomfortable as possible for Derry by getting men behind the ball in a manner similar to London last week. Seven days ago against Limerick they never fully recovered from the early concession of five successive points and when you consider their scoring tally in the lowest in the division after two games, it’s not difficult to see where the problems lie for Whelan. The Oak Leafers coped fairly comfortably with the massed London defence last week although the Exiles’ mini-scoring burst of 1-02 in side two first half minutes highlighted the dangers of being lulled into a false sense of security and McErlain will be keen to see the lessons of last week have been heeded.